There was a nice southerly blowing at Altona today. I took some photos from the shore. We visited the beach on our way back from Werribee Open Plains Zoo. It looked like a nice 18 knots session. Another late sea breeze after a cold wet morning. The sun was shining but it was still cool. I put on my 1mm steamer and my vest and headed out for a session on the S-Quad surfboard. It was nice riding the board powering over waves. I kept the power on and jumped a few. It feels weird jumping with a surfboard, and I am a cautious about a big crash. The board is quite solid and the quad fins quite sharp. Going upwind was easy. 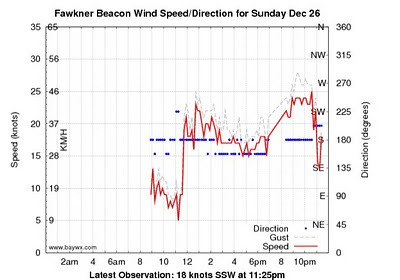 The wind was stronger and more consistent past the breakwater. I carved some turns to toeside and back on several occasions, watching to make sure the spreader bar did not release itself again. Riding toeside with the seat harness is not easy. There were only about 6 kiters about and no windsurfers. Most people may be out of town for the Christmas holidays. There was a reasonable swell rolling in, and occasionally breaking a long way out. Returning to shore I could carve on and around the swell which was enjoyable. I came downwind by cranking slalom turns. It wasn't really possible to "park the kite" as there were no rideable waves. I tried a couple of gibes and was able to swap my feet (sort of) on one, even though I was lying in the water. On another attempt, my kite hit the water and almost jellyfished, but I was able to relaunch it eventually without twisted lines. I had visions of self-rescue and drifting all the way back to shore, as I did during some of my first sessions at Hampton. I take my hat off to those who ride surfboards strapless. I find the straps very useful when getting going, and for powering over lips. I keep my rear foot out most of the time now though. After an hour my feet and hands were cold so I came in. A great sea breeze. This is largely cosmetic, nothing much else will change, and the old URLs (with .blogspot in them) will still redirect to the new address. A reasonable south easterly came in late in the day so Stuart and I headed down to Beaumaris beach at Ricketts Point. I took some photos when I arrived then headed out with the 14, the S-Quad surf board and the seat harness. It was a bit cool so I wore my wetsuit. I was keen to get out to work of a little of the extra ballast I had acquired from Christmas meals, even though I should in theory have been resting my strained back. I figured a short session with the seat harness would be OK. It was good fun on the surfboard. I tried gibing and discovered its a black art. Its very difficult to switch your feet around while in motion and under power. I need to read up some more on this to get the technique right. I did some "power turns" to toeside which were fun. On one occasion I overcooked it and crashed, then found myself getting dragged back to shore by my kite which was sitting vertically just on the water. I was unable to relaunch it, until I realised that one rear line was looped over the bar. Once freed, the kite flew again. The board felt like a cork bobbing on the bay swell - a big difference from the carving twin tip. I was able to go upwind well and even depowered the kite when the wind picked up. I rode toeside for a bit too - even though the seat harness is not ideal for this - you can't swivel the harness around to get the line pull on it more direct. The bar actually unhooked from the harness too, but I was able to reattach it with the kite above my head. Its always worth doing your harness up tight before you go out. I had the best fun cranking slaloms - turn the kite - carve to toeside - turn the kite - carve to heelside - and repeat. 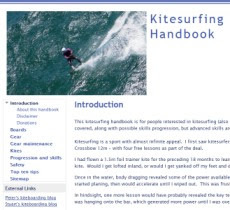 This is good practice for surf riding as it hones board and kite handling skills, enabling quick takeoffs and "turn arounds". Its a nice way to go downwind too. What to do when the wind is not blowing? Theres Stand Up Paddleboarding (SUPs), surfing, swimming, fishing or sea kayaking. It has taken me 35 years to realise a teenage dream to paddle out to one of the islands off the western side of Wilsons Promontory. The day after our epic sessions in Norman Bay at Tidal River had no wind and was fine and sunny. The route was direct to Norman Island, around it anti-clockwise then return to Tidal River. I had a brief fish in Norman Bay but had no luck, so I set off on my journey to the island. Heading out there against the swell was consistent paddling but not difficult. It was great to finally get there, then shelter in the lee of the island and take in new vistas of Wilsons Promontory. The water was clean and green. A couple of pairs of Cape Barren Geese were nesting on the island and honked a bit, but I kept my distance. There is nowhere safe to land as a swell still reaches behind the island and it is all granite with no beach. These islands are all bird sanctuaries so landing is not permitted in any case. Then came the dicey part - I headed out from the lee side and paddled around the island in an anti clockwise direction. It was much wilder and daunting in the open ocean. Big swells were coming in and then rebounding of the island and coming back out, which made for choppy conditions that threated to tip the kayak. I got a fright while taking a photo, so I paddled further out and kept going with firm strokes until I made it around. I had a paddle float and a bilge pump, but I really didn't want to have to use them. Once around the island I headed directly back to Tidal River, surfing down the decent rolling swell as it rolled past. An excellent short tour. The total distance was about 18km. It was a great trip, occasionally daunting, and not for the faint hearted or unprepared. You need to take self rescue equipment including a Personal Locator Beacon (EPIRB) when more than 2km off shore. A strong north westerly hammered Melbourne on Saturday 11 December. 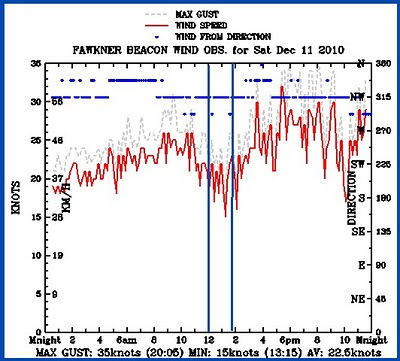 Hampton Beach was an excellent location for this wind. 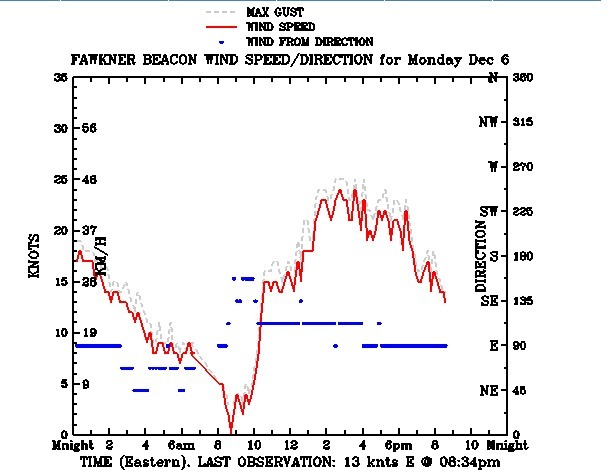 While a bit gusty, it was strong and fairly consistent around midday. The wind direction made the beach seem very different and the swell was rolling in an unusual direction. I did my first backroll. I was a bit tentative but got around. I ended up with the kite flying in the other direction so I didn't quite get it right. I find it a bit daunting to commit to this trick, but those who can do it keep saying how easy it is. I am also enjoying carving fast turns and ending up going toeside. These can also be done in sequence, which is a nice technique for going downwind, using the "turn the kite, turn the board" sequence. Its like a giant slalom. No kitecam shots - the camera resets the number of photos to 2 if you start it without the memory card in it. I need to check the number of shots setting before each time I use it. 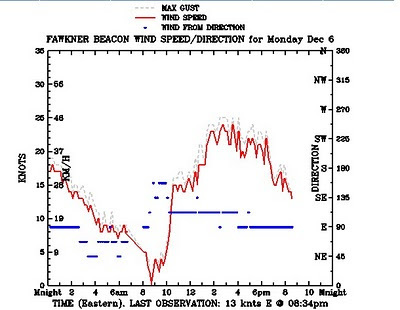 A good easterly was blowing during the afternoon. I decided to give Mentone a try for the first time. There is a cove and stretch of beach so self rescue for this wind direction is quite good. Unlike Ricketts Point, where you would end up floating out into the bay. On the way to the beach I assisted with some first aid for a school boy who had been hit by a car in Hampton - apparently he ran into the side of it. He was not in good shape but was breathing and had good circulation. The Police and Ambulance came quickly and said he would be OK. A sobering and traumatic event. I parked on the other side of Beach Road to avoid the exorbitant parking fees at the car park next to the Mentone Life Saving Club. There is a a nice grassy section with a path to the beach, and even a couple of grass circles at beach level. I self launched and headed out to join two other kiters already on the water. The wind was good for about 30 minutes, then it started to drop. I did some nice kitedown turns and toeside riding, and a few good jumps off the waves. After an hour the wind dropped further so I headed in and chatted to two local kiters on the beach. Its a nice spot - scenic and not too crowded. 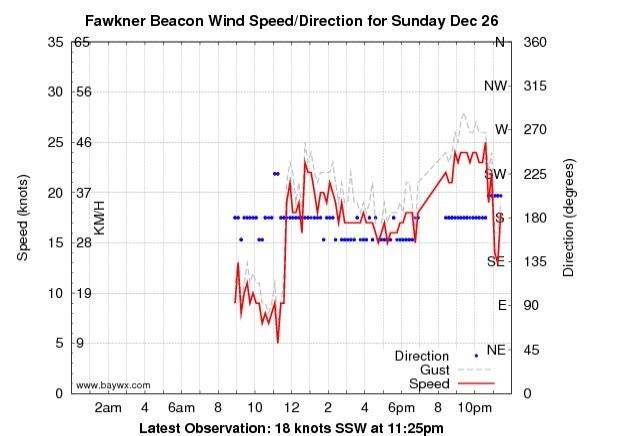 Its a good place to kite in an easterly and his much closer than Altona.